So many students with special needs are concerned with answering questions correctly. Do you have any of those in your classroom too? These daily questions are designed for students to practice answering questions errorlessly. I finally finished creating my daily questions for the year pack over Christmas break and absolutely LOVE how it turned out. It has already made my morning run smoother, and I love the added communication piece this brings to our morning meeting. Each day we have a new question on the board. I store these in a file folder and switch out the question each morning. Students answer the question based on the two choices during morning independent work. Many of my students use devices, so they are expected to prepare their answer on their device. Students can use the sample sentence under the question each day to help them write (and say) their answer. For my students who do not use devices (or who are super fast), I also give them a weekly worksheet for our daily questions that they keep in their morning binder. There are several worksheets based on student levels. 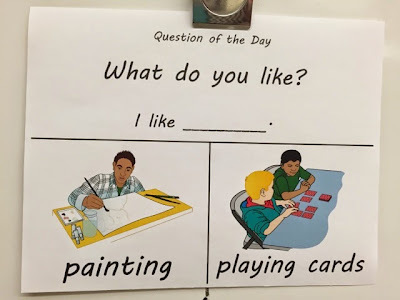 One involves drawing a picture answering the question, another writing the answer, writing the answer using a complete sentence, and answering the question plus adding details. 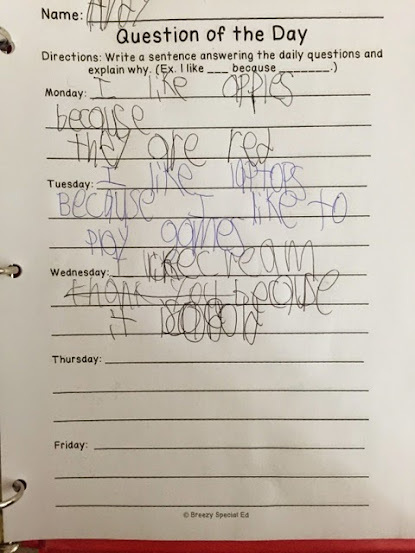 This semester I got a new students in my class because his behaviors were causing issues in the higher level class, and since my class is more individualized, we wanted to see how he would do with that. I have given this student the higher level journal and so far this part is going well! 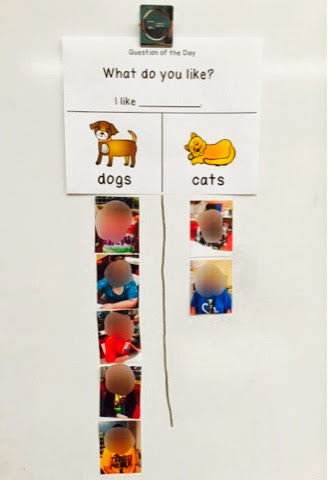 During our morning meeting, each student shares their answer and we move their picture under their answer choice, creating a graph of sorts. It is a great way to learn about everyone and also helps teach students that there isn't always a “right” answer, and that it is okay for your answer to be different than someone else’s. 20 personal info Yes/No questions. I included these at the beginning of the Yes/No questions because I wanted their to be opportunities for students to learn that is okay to answer no sometimes! This questions will always have a clear answer and staff can work with students to make sure they are answering correctly. 78 Do you like ____? Yes/No questions. For many students, answering Yes/No questions can be difficult. Many students are conditioned to always say “yes” (or “no”). It is important for these opinion question, that staff responds positively to all choices as not to make a student think they answered incorrectly. What makes me even happier than using it in my classroom, is hearing how much others are loving this product as well! I love making things that not only help me, but help other teachers as well! Here's a couple of the comments from people who have purchased this packet on TpT. Pam H: "This pack is perfect for my classroom. My students are all nonverbal or very limited in verbal skills. This pack will help us work on communicating with one another. I'm also going to use some of the questions with my students receiving discrete trial instruction. Thanks for a fabulous product! Totally worth the money!!" Kandi G: "Love it! 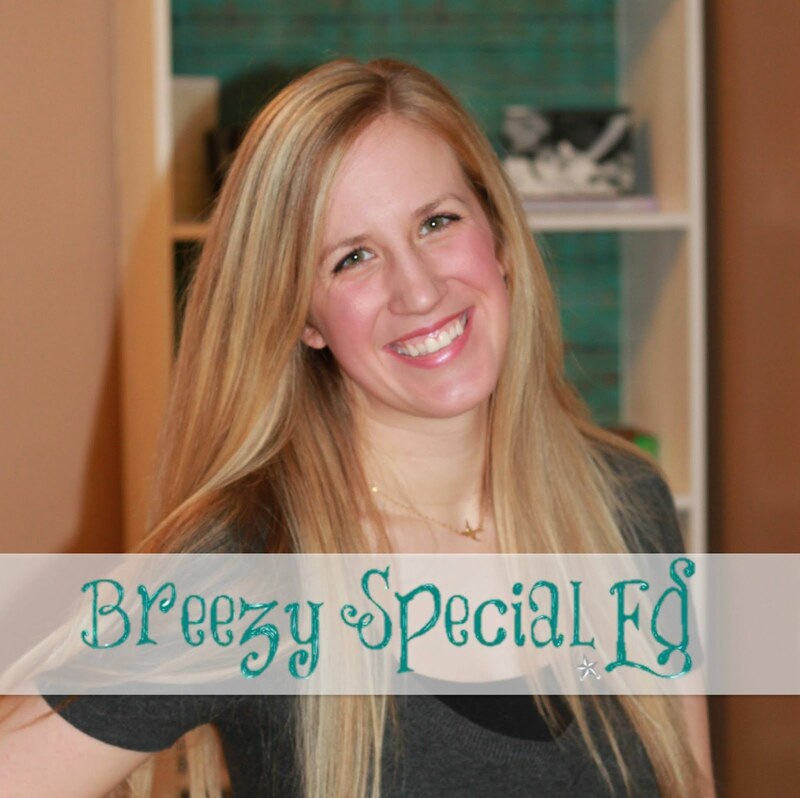 I've been looking for something exactly like this"
Erika W: "Love using this with my special needs students. It works for my students with communication devices, but also for my verbal students. It helps with their sentence structure and speaking in front of a group. " Brittany M: "I absolutely love this for my FMD/MSD class. I have a wide age range and there is so much that I can do with this for all different levels. Thank you!" Watch a video preview of this product below. You can get the Daily Question pack in my TpT store which includes 180 questions with visuals plus four differentiated journal pages!! Want more? Grab the second pack of MORE Daily Questions too!